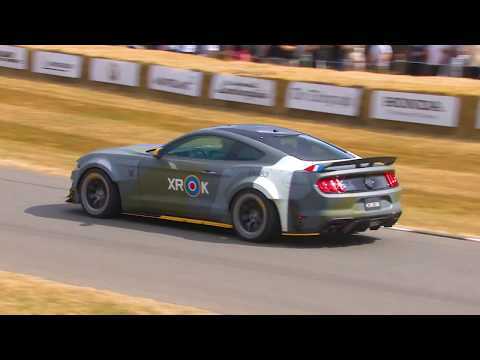 The dust has settled after another amazing Goodwood Festival of Speed weekend. If you missed it, you might be quite jealous and plotting a visit for next year, or if you went you might savour the memories and want to re-watch some of the highlights. The GT was bred for the racetrack, so it blitzed up the course. It’s amazing how flat the car is through the corners, and you see the adaptive spoiler working to improve its aerodynamics and acting as an air brake to dial down the speed for the tight corners. 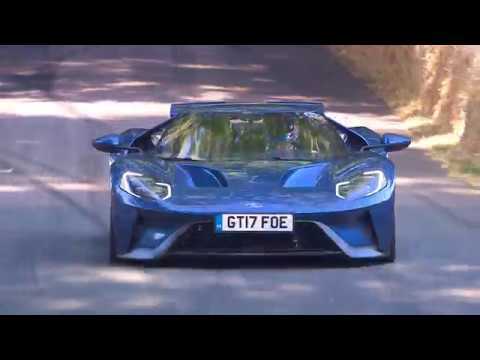 This blue Ford GT looks stunning in this setting – it’s unbelievably low and wide, and those flying buttresses add serious presence. As you’d expect, the noise from the 647hp 3.5-litre V6 is equally impressive. It’s worth watching the video for the noise alone! We said there was a Fiesta for everyone, and that includes rally drivers. This M-Sport car looks like a Fiesta that’s spent a lot of time in the gym, with its unmissable rear spoiler, diffuser and boxy wheel arch extensions. The noise is raw and unfiltered, bringing a dose of thumping motorsport sound to the usually serene Goodwood estate. 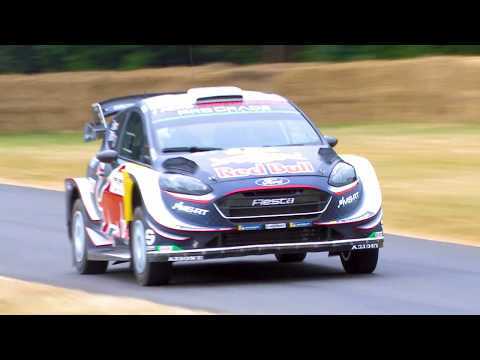 Welsh rally driving ace Elfyn Evans clearly wanted to put on a show for the crowds. He span a couple of doughnuts on the way up, kicking up smoke and the manicured grass. Look closely, and you’ll see some MS-RT stickers on the car too. 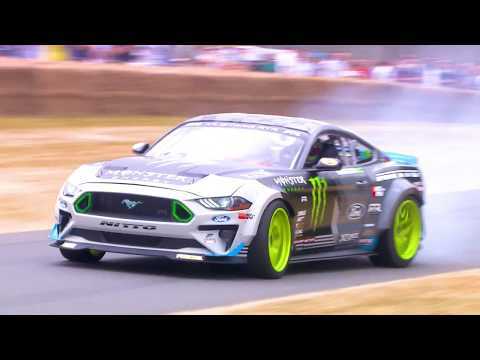 A lack of sound on this video makes the Eagle Squadron Mustang look like it’s going slowly, but Vaughn Gittin Jr. is driving it hard and fast. This car might be a one-off – to be auctioned off for charity soon – but Gittin Jr. is a champion racing driver, and wasn’t going to go lightly. See the massive burnout at the start for proof! This is Gittin Jr.’s company car, a bespoke drifter created by his company, RTR. 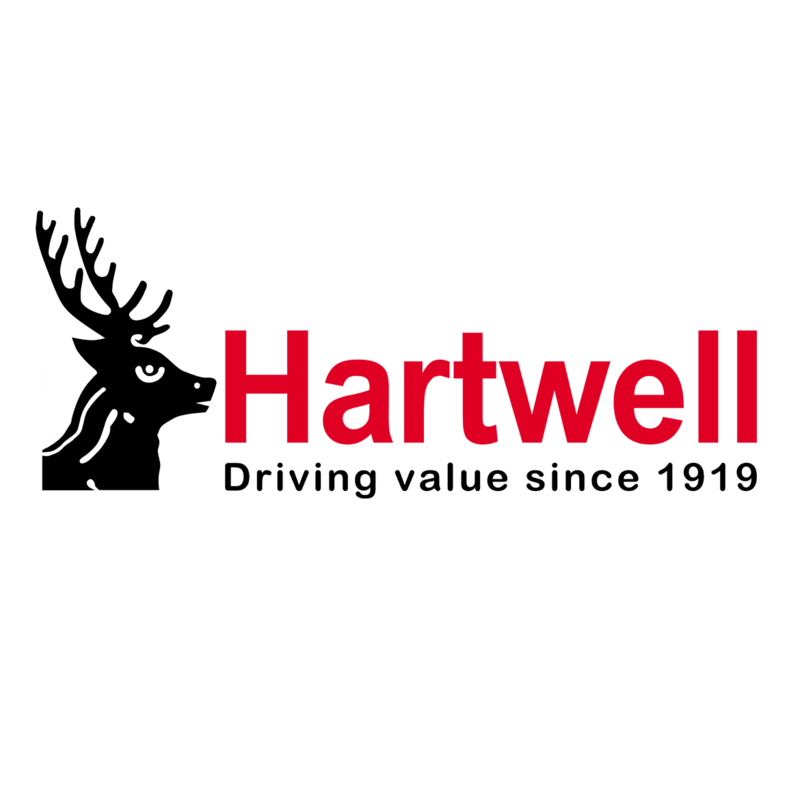 The Goodwood Hillclimb can’t be the easiest drift course, but a combination of a hydraulic handbrake, plenty of horsepower and the drift champion’s talents make it look easy. You can hear the engine bouncing off the rev limiter, and see the black lines left on the Duke of Richmond’s driveway. 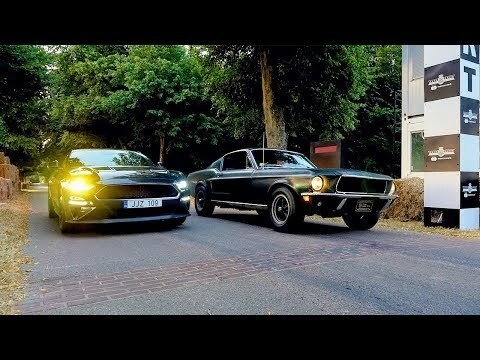 We were treated to both Bullitt Mustangs – the original and 50th Anniversary edition – heading up the Goodwood Hillclimb course over the weekend. This 1968 car was driven in the Bullitt movie but was lost in storage for three decades, and appears to be still under restoration. The paint certainly looked shinier in the film. That’s probably why the owner took the course rather tentatively, but it meant the audience had plenty of time to enjoy it. Both cars together made an excellent photo opportunity, and crossed the start line together. The new car engaged ‘Line Lock’ at the start to create that burnout, and then sped up the course thanks to the 475hp 5.0-litre V8 engine. If you need one in your life, get in the queue. It’ll come to the UK as a special edition, costing from £47,415. 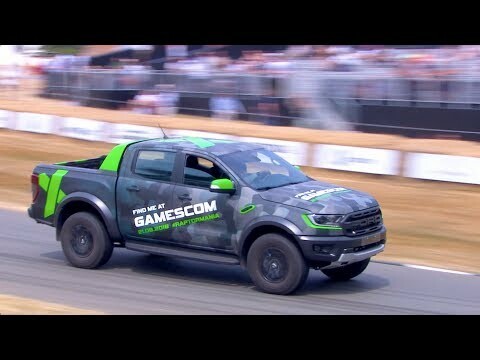 It wasn’t long ago that the tuned ‘Raptor’ version of the Ranger pickup was confirmed for UK shores. 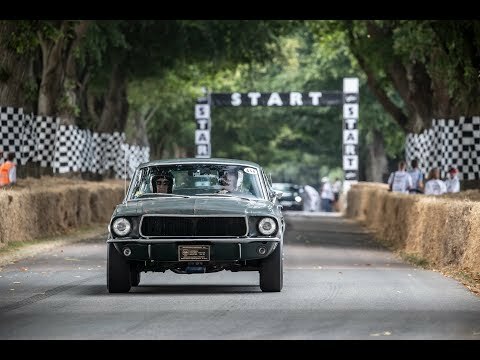 Ford brought it along to Goodwood, and it took to the hill like a naughty child – seemingly doing more doughnuts than straight driving. The jump at the start also showcased the uprated suspension that will be fitted to the Raptor. Which was your favourite Ford at the Festival of Speed 2018? Share this article using the icons at the top of the page.